The Post Office has revealed that it will introduce contactless payments at every branch across the UK. All 11,500 locations will be fitted with the payment terminals, allowing patrons to settle up using contactless bank cards and NFC-equipped mobile phones, just by waving them at the in-store reader. The roll-out will begin next week and will be completed by October, making the Post Office the largest user of the tech in Europe, the Guardian reports. 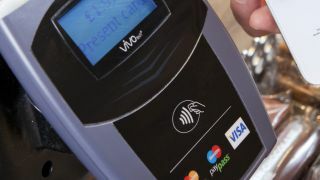 The terminals will be compatible with the Visa payWave and the rival MasterCard PayPass service, with an increasing number of banks now giving their customers contactless cards. The readers can be used to make payments of up to £20 and will not require the buyer to enter his or her pin number. Barclays, HSBC, Royal Bank of Scotland, Natwest and Lloyds TSB are among the banks now pushing the tech within their bank cards. In smartphones, progress is a little slower than expected. BlackBerry leads the way, but the new Samsung Galaxy S3 has an NFC chip, while Apple is widely expected to introduce the technology within the forthcoming sixth-generation iPhone. Last month Barclaycard introduced the PayTag sticker embedded with the same NFC tech as its contactless cards. It can be attached to the back of a mobile phone, but doesn't require the phone itself to work.